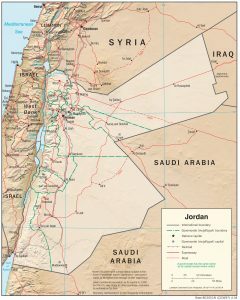 Located in the heart of the Middle East region, Jordan has for long welcomed refugees looking to escape regional crises, particularly in the past sixty years. Such migration has led to huge population growth and changes in the make of up the domestic population. In recent years, the Syria crisis has had particular impact on the country as a whole with over one million Syrian refugees now living in the country as a result of the brutal civil war. This has had a profound impact on access to resources generally in the country. In Syria itself today, 13 million people need aid, 6.5 million don’t have enough to eat, 4 out of 5 live in poverty, and 1.75 million children are out of school. The risk of a lost generation has never been greater, as we face the largest refugee and displacement crisis since World War II. Last year, the education of over 75 million children was disrupted by crisis and emergency – from the Nepal earthquake and the ongoing conflict in Syria to the Ebola outbreak and the earthquake in Ecuador. Jordan is a prime example, as schools have struggled to cope with the sheer volume of children in need of education. Multiple factors explain why children have been unable to attend school. These include poverty and school related fees, access to transport, school overcrowding, cultural patterns of not prioritising education, and informal tented resettlements. Wide strides have been taken at the country level towards addressing the need and improving the educational services, led by the Ministry of Education. Double shifted schools have been established, in which Syrian and Jordanian students attend separate morning and afternoon shifts. More training has been provided to teachers to increase learning quality. UNHCR, one of our partners for the upcoming Jordan project, is working closely with the MoE and UNICEF to advocate and push to strengthen the numbers of children enrolled to schools, through several initiatives such as the Learning For All campaign, and cash assistance programmes to support desperate families who otherwise might opt to have their child work. Our role will be to understand the core issues in areas such as Mafraq, Zarqa, and Irbid, and use play based activity to promote and direct children and their families to these resources. To discuss what more can be done, and to understand how our tried and tested model can be used as a force for good in the region over the coming years. We are fully aware of the scale of this issue alone. We hope the project, which will be the first of its kind regionally, will enable us to demonstrate that the sport of cricket does not have boundaries, and can bring happiness and meaning to those who are able to play it. The catastrophic education issue will be our initial focus, we also hope this initial project will enable us to understand where we will have most impact over the coming years. Thank you in advance to our partners UNHCR and Right to Play for their insight, support, and guidance. Sounds like a fantastic project and again, CWB right at the heart of it and using cricket to engage young people and communities. I will be keeping up with the blogs keenly. Good luck team – you will be awesome ?? ? ?